After a large renovation, the “Golf Course of Montado” reopened in September 2006 and presents itself as one of the most beautiful and competitive courses of Portugal, in line with the excellent of the courses “Quinta da Ria” and “Quinta de Cima” (from the same group of promoters). The golf course with 18 holes and par 72 (6.366m), is distinguished by a landscape dominated by vineyards and flat morphology region, developing in a fitted oak where streams and lakes make it unique. 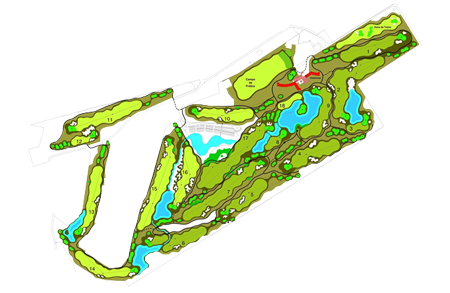 The layout of the course offers large greens and holes with particular characteristics, which highlights the 18th hole where the green is situated on an island. The Clubhouse (2000m2 covered) is also being refurbished and will feature a SPA, a Gym, Sauna, Turkish bath and a Swimming pool.